I made a trip down to the states after work today with one of my girlfriends to hit up my favourite place to grocery shop – Trader Joe’s. 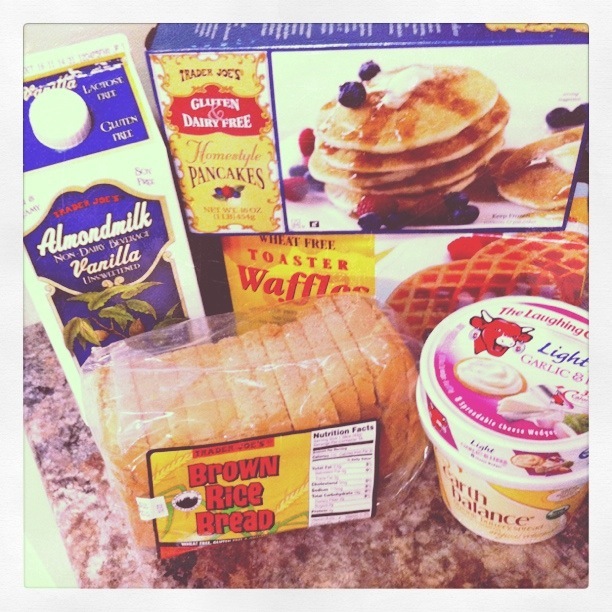 Unsweetened Vanilla Almond Milk, Gluten & Dairy-Free Pancakes, Wheat Free Toaster Waffles, Brown Rice Bread, Light Garlic & Herb Laughing Cow Cheese, & Earth Balance Whipped Butter. 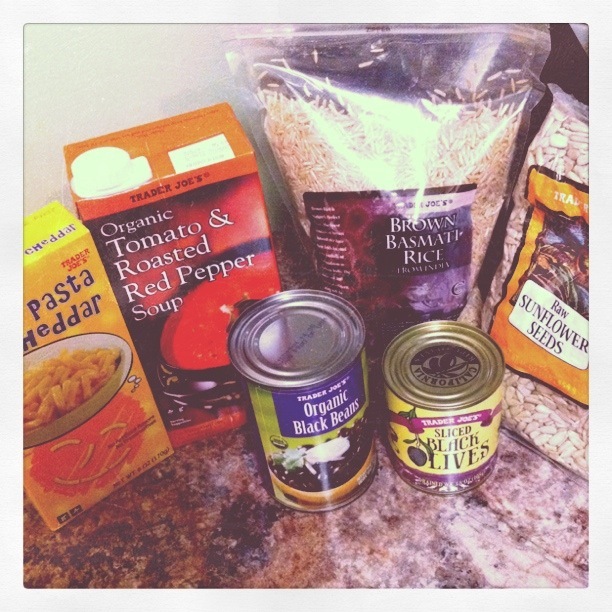 Rice Pasta & Cheddar, Organic Tomato & Roaster Red Pepper Soup, Brown Basmati Rice, Raw Sunflower Seeds, Organic Black Beans, & Sliced Black Olives. 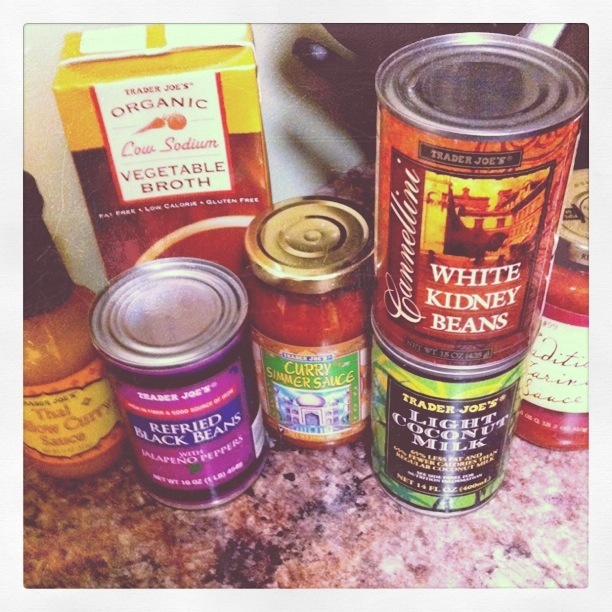 Organic Low Sodium Vegetable Broth, Thai Yellow Curry Sauce, Refried Black Beans with Jalapeno Peppers, Curry Simmer Sauce, White Kidney Beans, Light Coconut Milk, & Marinara Sauce (99 cents per jar!). 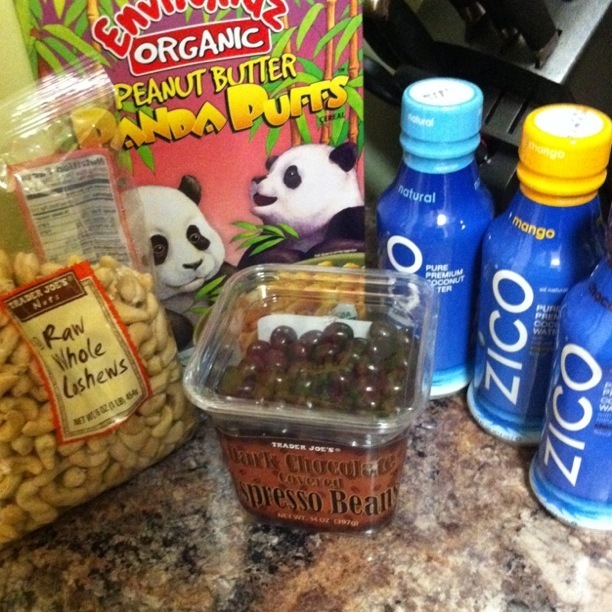 Raw Whole Cashews, Peanut Butter Panda Puffs Cereal (x3), Natural Zico Coconut Water, Mango Zico Coconut Water, Chocolate Zico Coconut Water (Not so sure about this one! ), & Dark Chocolate Covered Espresso Beans. 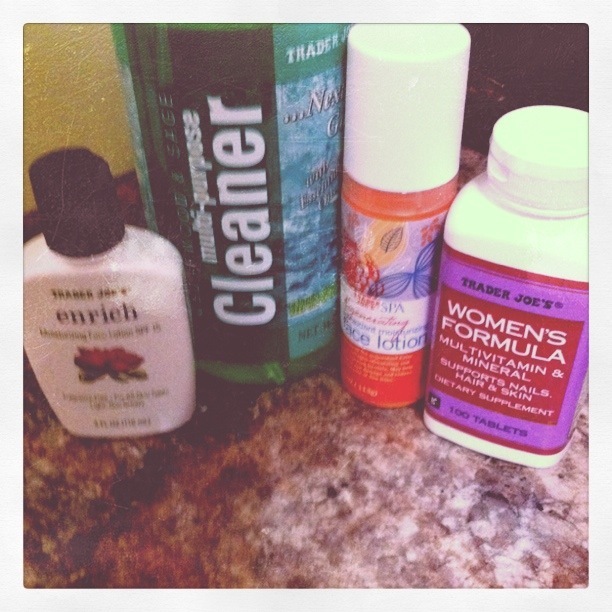 Face Lotion with SPF 15, Multi-Purpose Cleaner, My Favourite Face Lotion, & Some Multivitamins. I also picked-up a package of polenta (which I did not photograph) because I saw the gluten-free label on it, and thought I’d give it a try. I’ve never had it before, and haven’t the slightest clue what to do with it exactly. Any ideas? I live about an hour from the nearest Trader Joe’s – easy enough to run down and stock-up on some gluten-free favourites that don’t cost an arm and leg! I had a super easy time crossing the border both ways, which was nice. I think more Canadians must be venturing down to TJ’s because I no longer get strange looks or questions from the border guards over why I’d be going down to the states to grocery shop… Yay! Have you ever been to TJ’s? Have any favourite TJ items?